In Russia, Another BMW-Powered Volga, You! In Russia, updating old Volgas with modern hardware has been a staple of the custom crowd. It's a natural, considering the original GAZ Volga is as much a beloved member of the USSR's vehicular past as the '57 Chevy is to Amerikaners. 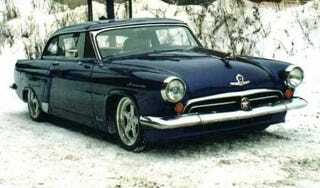 Carscoop, whose eye is always on the Volga pro-touring scene, came across a new addition. Or rather, an old edition that's worth eyeballing anew. This Volga was recast nearly ten years ago by El Motors, using the running gear from a 1994 E36 BMW M3. No word on the condition of the donor car. We're imagining it was lost to an incident involving the Russian mafia, a double-crossed deal to sell copper tubing stolen from a defunct state office building, and a rogue Soviet cop fighting to protect a fledgling democracy from devolving into lawlessness. But that's just us.